From penal colony to coal port to ghost town, Newcastle’s bleak history is now a thing of the past, heralded by an exciting, cutting-edge district emerging from its CBD. Most of my friends and family reacted with bewilderment when I mentioned we were having a weekend away in Newcastle. “What’s there?” they asked. Granted none of them have really been to the city in a long time – what they remember from their last visit is deserted streets of vacant shops, derelict buildings and empty office spaces. Indeed, on my recent visit to the city’s up-and-coming East End, I saw glimpses of this sad reality that has tainted Newcastle’s reputation in recent years. It’s a reputation that begins back in the late 18th century after the discovery of coal in the region. A penal settlement was established in 1804 and named after England’s most famous coal port; it was a dreary place, home to more than a thousand convicts who were under brutal military rule and forced to work under terrible conditions in the mines. By the late 19th century, a thriving industrial base of the city had been established and Newcastle had become a major coal producer; as such, in 1911 BHP chose the city as its main site for steelworks. But at the tail-end of the century, some unfortunate events caused a gradual period of decline in the number of people living and working in the city: it was devastated by a 5.6-magnitude earthquake in 1989; in 1999 BHP withdrew its major industrial operations from Newcastle; Honeysuckle, a shiny new waterfront precinct to the city’s west began drawing visitors away from the city centre in the ’90s and 2000s; its most iconic retail store, David Jones on Hunter Street, permanently shut its doors in 2011; and the city’s train line was truncated in 2014. Newcastle’s CBD was all but dead. 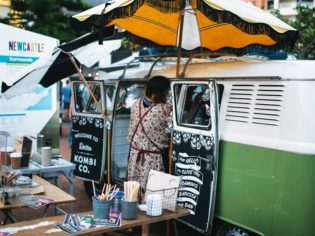 Today things are on the up; thanks in part to Renew Newcastle, an initiative credited to revitalising 50-plus empty shopfronts in Newcastle’s CBD by offering free pop-up spaces to creative industries. This began to inject some life back into the city and gave other business owners the confidence to come and try their luck. We start our day in the city’s East End at One Penny Black, opposite the David Jones building in Hunter Street Mall. This unfussy little cafe has great coffee and a fantastic all-day breakfast menu (the raw chia, buckwheat and blueberry bircher with coconut-crusted fresh mango and organic yoghurt had me whispering ‘wow’ at every bite). While you’re here, be sure to pop in next door to Doughheads, to purchase a decadent melt-in-your-mouth doughnut (or a dozen) – scrumptious flavours include salty nut, maple bacon, mango macadamia and Iced VoVo. Cross the mall to the old DJs building, which is now home to The Emporium, a Renew Newcastle project, where you’ll find a collection of boutique artisans selling their wares including Jodie Louise Millinery (bespoke headpieces), The Carved Greenman (artistic stone carvings), CCY Studio (handcrafted leather goods), 33 Degrees South Soap (cold-pressed soaps), and VOUS (modern women’s wear). Continuing east along Hunter Street Mall, you’ll pass a number of great stores including Sol Invictus, a hipster-slash-badass Australian motorcycle company. Even if you aren’t in the market for some riding gear, stop by to ogle at the custom Mercury 250cc cafe racer. Further down is Studio Melt, formerly part of Renew Newcastle, which is a jewellery workshop and retail store selling pieces from contemporary artists, as well as fashion and vintage homewares. If you have the time, coordinate your visit with one of their workshops to learn the art of jewellery-making yourself. Just a couple of doors down from here is The Lair; this super-cool fashion store stocks the likes of Zimmermann, One Teaspoon, Camilla and Marc, and Alice McCall. As you wander around, you’ll notice that many walls on buildings, carparks and alleyways are not bare, nor are they covered with graffiti; they’re adorned in bright, fabulous street art that captures the spirit of a place in the midst of a regeneration. With art on your mind, continue down the street to the Lock Up. Housed in Newcastle’s former Police Station (from 1861 until 1982), the Lock Up now includes a purpose-built gallery for contemporary arts. Artworks are occasionally displayed in the former exercise yard and also throughout the heritage-listed cells; you can view the original padded cell, which has ‘SOS’ still scratched into its wall. Yikes. If you’re hungry for an early lunch, take a short three-minute detour south along nearby Bolton Street to Bolton Street Pantry. This industrial-style cafe serves up a great menu for breakfast and lunch – I recommend the delectably fresh black rice bowl with charred corn, avocado, Spanish onion, sprouts, nuts, garlic olive oil and fresh lime. The coffee served here is roasted by Sydney’s The Grounds of Alexandria, and it’s made perfectly. 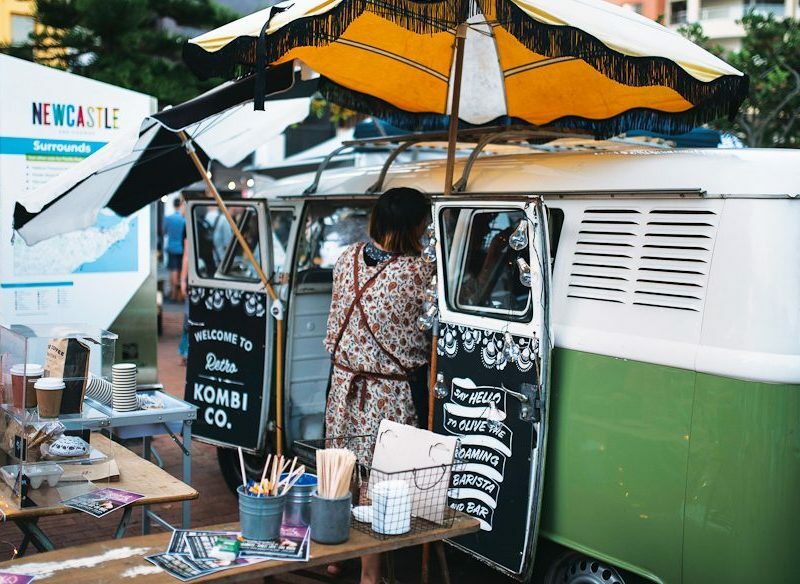 Otherwise, if you’re in the city on the third Saturday of the month, grab a quick bite at the Hunt&Gather Markets: these boutique designer markets are held from 9am to 2pm under shady fig trees at Pacific Park and are a must-visit. From the market, you are just a stone’s throw from The Grain Store, a craft beer cafe located in a restored warehouse, which features a 21-strong tap list of 100 per cent independently owned and Australian-brewed beers. It also runs regular Beergustation dinners, which pairs dishes with beer. For a change of pace, take a hop, skip and dip in Newcastle Beach’s famous Ocean Baths. Opened in 1912, the historical baths have an exquisite 1930s-built Art Deco façade; there’s also a kids’ wading pool, which is the perfect spot for families. When the sun goes down, you have a host of options for pre-dinner drinks. Back on Hunter Street there are two beautiful heritage buildings that formerly housed banking institutions; in one is French restaurant and lounge, Le Passe Temps, and across the road is Reserve Wine Bar, with a sophisticated interior, extensive wine list and bar snacks to graze on. Its wine tasting flight ($20) is the perfect option to sample the drops on offer. Parallel to Hunter Street is King Street, home to Red Baron’s Berlin Bar, a super-sultry lounge bar inspired by 1920s Berlin. Stepping behind the frosted Art Deco doors is like stepping back in time: dim light, waist-coated staff, classic cocktails, smooth jazz, and ornate and eclectic furnishings complete the nostalgic scene. Afterwards, make your way to Bocados, an intimate Spanish kitchen with an evolving tapas menu just a few doors down. Tip: be sure to book – this place is popular. Another tip: you must order the churros. Keeping things European is Una Volta, just a five-minute walk west along King Street. This cosy restaurant serves up authentic Italian cuisine with superb, down-to-earth service. On Friday and Saturday nights, the menu comprises three, very generous set courses accompanied by live music – and, bonus, it’s BYO. We stayed at Novotel Newcastle Beach, which is in a fabulous location right near the beach. It’s also opposite East End Hub (eastendhub.com.au), which is a relaxed cafe serving a menu focusing on locally sourced produce and great coffee, and next door to the sweet little Bar Petite. But at some point, you should probably balance out all that eating by strapping on your sneakers. Head to Newcastle Beach and turn right for the Newcastle Memorial Walk. Walk along the esplanade and through King Edward Park to the official start of the track at Strzelecki Lookout (named after Polish geologist and Australian explorer Sir Paul Edmund de Strzelecki). From here, the walk follows a 450-metre cliff-top bridge to Bar Beach. The views are spectacular with memorials along the way that commemorate the 11,000 local men and women who volunteered in the First World War. Alternatively, you can turn left at Newcastle Beach and take the Newcastle East Heritage Walk to the harbour, passing many of the city’s important heritage sites including the Ocean Baths, Fort Scratchley, Nobbys Lighthouse and the Convict Lumber Yard – be sure to stop in along the way. The official Heritage Walk loops around the CBD but you can keep walking along the waterfront to Queens Wharf Hotel for a feast of good ol’ pub grub. From here, there’s an overpass that takes you back to Hunter Street Mall. Indeed, next time I am met with questionable looks regarding Newcastle’s weekend getaway potential, I’ll be happy to set the record straight. What with its beaches and coastal walks, important historical sites and beautiful heritage buildings, as well as great inner-city haunts where you can indulge in some amazing food and wine, Newcastle’s East End has huge potential with all the ingredients to make it a bona fide hip hood – a completely underrated one at that. Newcastle: Australia’s next big weekend away?